Do you make your own choices or have circumstances beyond your control already decided your destiny? For thousands of years, this question has intrigued and perplexed philosophers, scientists, and everyone who thinks deliberately about how they choose to live and act. For if free will makes us accountable for our choices, does the opposite hold true, that determinism absolves us of responsibility?The implications of how we resolve this great question can affect everything from the small choices we make every day to our perspective on criminal justice and capital punishment. Now you can begin - or continue - your own exploration of this fundamental issue in a series of thought-provoking lectures from an award-winning scholar acclaimed as one of the most innovative thinkers now working at the intersection of philosophy and psychology. 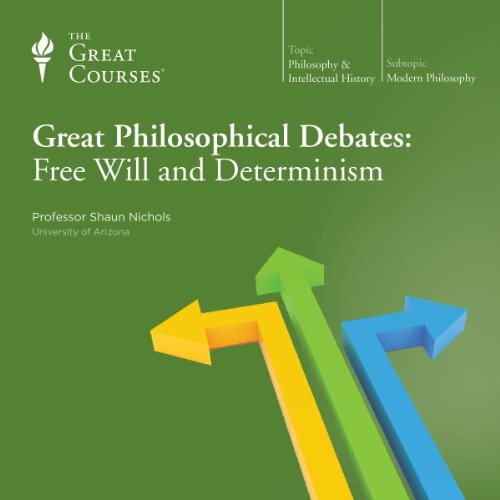 Beginning with an explanation of the fundamental approaches to this debate, Professor Nichols prepares you for an in-depth study of the complexities of free will and determinism. You learn what great thinkers through the ages have believed about the choices we make and understand how we might deal with their implications. Professor Nichols looks at each side of every argument, creating a balanced perspective that invites you to come to your own conclusions about whether or not we control our lives. This will challenge how you think! Free will vs Determinism is one of those questions that I've always struggled to wrap my head around. How to reconcile what is clearly a universe whose parts are governed by well understood and well described forces and laws with human behavior that, at least for most of us, appears to entail acts of free will? 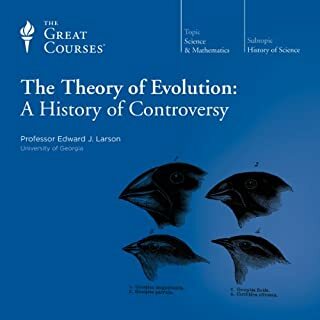 First off - this series of lectures from the Great Courses series doesn't settle the argument. Not only I, but philosophers in general are still struggling over it. However, what this course does and does well is introduce the various thoughts and concepts, both historical and current, on the nature of free will. Cases are made from different approaches for both sides - that Free Will is true or that Free Will is false. These lectures cover the first half of the course and give me a lot of what I was expecting to find. The later lectures that make up the second half of the course build on this and go in directions I didn't expect. Offering more abstract discussions on what free will really means. In addition, there are lectures bringing in the results and observations of neuroscience and speculations about what they mean to the free will consideration. Finally, there's discussion about morality, crime and punishment considered both from the notion that free will is true as well as the implications of determinism being true. I found the lecturer easily listenable - neither put to sleep monotone, nor excessively dramatic. Overall I found the course interesting and challenging. It's helped me better understand my own beliefs and given me some new things to consider. I rate it a high success. 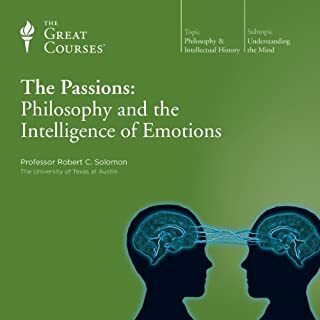 This is my first exposure to one of The Great Courses products since they became available on Audible and I look forward to exploring other titles. Why Are You Reading This Review? Are you reading this review because of free will or have all the variables that comprise "you" lead you to read this review? Typical scientific reasoning suggests that if you knew all of the variables contributing to an outcome, then the laws of nature could predict the outcome. Why then do we think that we are the exception to this logic? These lectures tackle these types of questions. The scope of these lectures is too vast to summarize easily. Indeed, sometimes I felt lost amongst all of the different schools of thought. The content of these lectures is approachable but advanced. It brings together many different philosophical ideas. The later lectures were more accessible as they touched on the application of these philosophical ideas to concepts such as crime and punishment, brain function, and quantum mechanics. 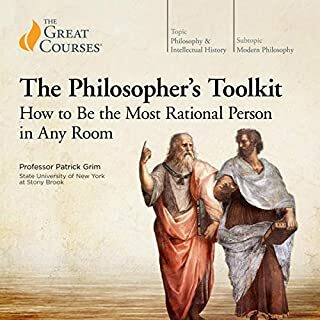 This is not a lecture series I would recommend to someone new to philosophy or to someone that has only a passing interest in philosophy. These lectures require careful listening and some thought. I would, however, recommend them to someone that is very interested in philosophy. I enjoyed them. 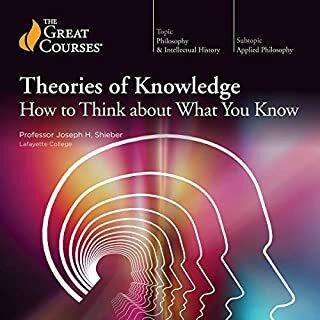 This was the second great courses audiobook I've done, so I had a decent idea of what to expect on the style and depth of the material. In that respect, it was deep enough to get a good understanding of the topic, but probably not deep enough for someone whose done dedicated research into it before. 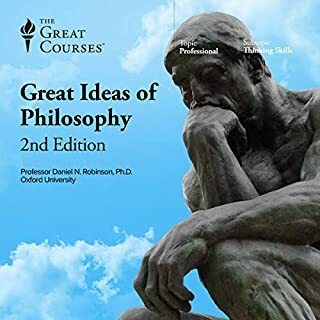 For me, coming from some philosophy courses at university, I had a decent understanding of the concepts already, but I never delved into it much. Based on that, I really enjoyed this course. The lectures all had clear points and were well connected to each other and the main topic. The philosophies of each argument seemed well summarised and nicely explained in each case. The narrator/lecturer spoke in a natural and expressive manner which gave me the impression that he was just as excited to be teaching this course as I was about learning the concepts. There were a couple of instances where I lost the train of thought a bit, but those were more from my internal diversions on thinking about the topics and not paying enough attention to what was being said. I particularly enjoyed how the lectures were structured by going mostly chronologically on when the different concepts were developed. Some of the later lectures weren't quite as interesting since they went more into the legal and moral implications of some of the arguments of each side, but that's not to say they weren't still quite enjoyable and interesting to think about. Based on the course, I've definitely been swayed to the determinist side. I actually came to that conclusion quite early on and it was fun to have internal arguments with myself based on arguments both against determinism and also interpretations and justifications for determinism that were not in line with my view on it. I honestly can't think of any noteworthy issues regarding the course and therefore I'd highly recommend this course for anyone even mildly curious on the topic. Absolutely fantastic. Best course yet. The instructor was incredible. The topic was timely and relevant. I feel that I benefited from this experience. It's a good lecture. BUT So Biased!! Failed to keep up his promise of being unbiased. He didn't draw on the most recent studies from Neuroscience that we do have free will. Evidence from Neuroplasticity and the impact of Deliberate Practice really shows that we have free will, ability to change our habitual way of thinking, behaving, and go out of our characters. taking this course hasn't will forever change my life. it has changed the way that I look at the world and the way that I interact with people. understanding issues like Free Will and moral responsibility may seem arbitrary beforehand, but it is absolutely one of the most vital subject matters that we should be discussing. it is literally at the core of everything that we do and think and believe about the world. I implore you to give this course a chance and I believe it will change your life as it has mine. great listen, very interesting and thorough. many different arguments are analysed and disected, giving a broad overview of the freewill debate. To better understand free choice and determinism and societee and its impact on the decisions we make as individuals and collectively. 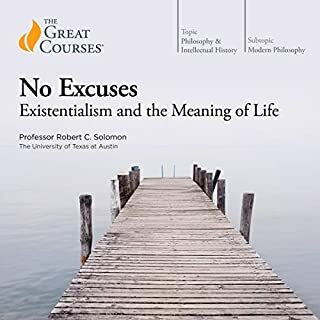 This book is a great introductory course into previous thinkers on both sides of the debate along with those few individuals you have advocated for compatible view between determinism and free will. I really enjoyed this course. It gave a great foundation for the topics required for a full look into free will and determinism. My only wish is that each lecture could have been longer and more in depth. Dr. Nichols did a superb job presenting everything at the surface level and giving a framework from which to build, but it only wet the whistle, so to speak. I say this not to knock the product in any way. Many of the topics discussed have entire courses dedicated to them and this course did a great job explaining the core of each. In short, this is highly recommended and will make you want to dive deeper into each topic discussed. The author gave an interesting and thought provoking account of determinism and free will. I particulary enjoyed the discussion on the scientific aspect. Definitely learned some new information concerning arguments on determinism and free will. This is an informed, authoritative and sympathetic lecturer providing a balanced and stimulating account. He has a really good tone as well. He provides the listener with numerous 'leads' should they wish to research further. Taking notes is advisable, especially for the first five or six lectures. Very highly recommended indeed. These lectures cover the issue of free will vs determinism from almost every angle, from religious to physical and psychological to legal and economic. From western and eastern cultural views. I also like how the relevance of the debate is discussed at great length in the later chapters. About half of the lectures are concerned with morality, so there is a lot of content here. Overall it's definitely worth a listen, the speaker makes it very easy to follow since it's a series of lectures rather than a book. The lecturer was really interesting and engaging. He's very good at delivery. The content started out fantastic. It's a very good gloss of the basic positions in the debate, and offers some excellent exploration of the implications. However, after lecture 19, the discussion drifted far afield into questions of moral psychology and criminal justice that are, at best, only peripheral to the overall debate, and at worst a complete distraction. I would recommend this series, but only if you don't have time to read a more focused book on the topic. One of the best books on Free Will. Loads of great information on Philosophical topics and debates. Best coverage of the free-will/determinism debate to date. Nichols is clear, succinct and his examples are exemplary.